A long time ago in a galaxy far, far away. 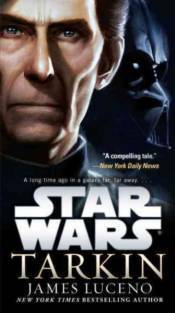 . . .Bestselling Star Warsveteran James Luceno gives Grand Moff Tarkin the Star Wars: Darth Plagueistreatment, bringing the legendary character from A New Hopeto full, fascinating life.He's the scion of an honorable and revered family. A dedicated soldier and distinguished legislator. Loyal proponent of the Republic and trusted ally of the Jedi Order. Groomed by the ruthless politician and Sith Lord who would be Emperor, Governor Wilhuff Tarkin rises through the Imperial ranks, enforcing his authority ever more mercilessly . . . and zealously pursuing his destiny as the architect of absolute dominion.Rule through the fear of force rather than force itself, he advises his Emperor. Under Tarkin's guidance, an ultimate weapon of unparalleled destruction moves ever closer to becoming a terrifying reality. When the so-called Death Star is completed, Tarkin is confident that the galaxy's lingering pockets of Separatist rebellion will be brought to heel-by intimidation . . . or annihilation.Until then, however, insurgency remains a genuine threat. Escalating guerrilla attacks by resistance forces and newfound evidence of a growing Separatist conspiracy are an immediate danger the Empire must meet with swift and brutal action. And to bring down a band of elusive freedom fighters, the Emperor turns to his most formidable agents: Darth Vader, the fearsome new Sith enforcer as remorseless as he is mysterious; and Tarkin-whose tactical cunning and cold-blooded efficiency will pave the way for the Empire's supremacy . . . and its enemies' extinction.Praise for Tarkin"Tarkintells a compelling tale of mystery while revealing much about a character who has fueled debate among fans since 1977, as well as the oppressive regime he represents. [James] Luceno has proven once again that the villains ofStar Warsare as much fun as the good guys. "-New York Daily News"Another home run in the new canon . . . This is the highest and best distillation of Tarkin stories, old and new, we've ever been given. "-Big Shiny Robot"A spectacular novel, with the intrigue, action, and profound characterization we have come to expect from the pen of Luceno . . . [Tarkin] provides a nuanced, multi-faceted anti-hero who is captivating, ominous, and calculating; in many ways, this is an origin tale of the Empire [and] a fascinating portrait of one of the more popular characters in the Original Trilogy. It may very well be one my favoriteStar Warsnovels. "-Coffee with Kenobi"A fascinating look at the pathos of one of the galaxy's most criminally underused characters. "-TheForce.netFrom the Hardcover edition.